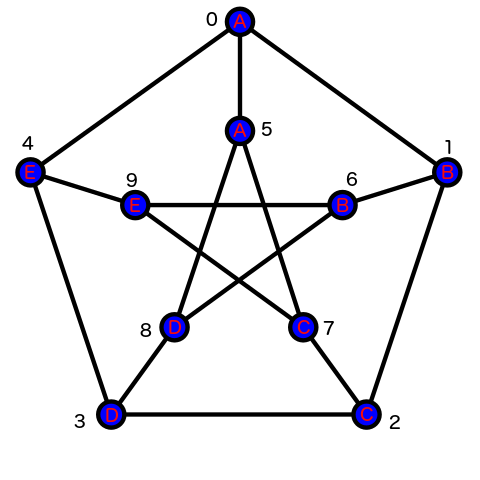 Let's consider a walk W in graph G, which consists of L vertices W1, W2, ..., WL, such that Wi is connected with Wi + 1 for 1 ≤ i < L. A string S of L letters 'A'-'E' is realized by walk W if the sequence of letters written along W is equal to S. Vertices can be visited multiple times while walking along W.
For example, S = 'ABBECCD' is realized by W = (0, 1, 6, 9, 7, 2, 3). Your task is to determine whether there is a walk W which realizes a given string S in graph G, and if so, find the lexicographically least such walk. The only line of each testcase contains one string S. It is guaranteed that S only consists of symbols 'A'-'E'. The output should contain exactly T lines, one line per each testcase in the order of their appearance. For each testcase, if there is no walk W which realizes S, then output -1. Otherwise, you should output the least lexicographical walk W which realizes S. Since all of the vertices are numbered from 0 to 9, then it can be encoded as a string consisting of symbols '0'-'9' (see the "Examples" section for more details). 1 ≤ |S| ≤ 100000(105).